BD: When did you begin playing an instrument? KG: I started on Piano at the age of 6. But didn’t particularly like it so I stopped when I was 8 years old. Then at 10 I started the Sax. BD: When did you first start taking lessons? I started lessons at my public school when I was 10 years old. In 4th grade. Once a week I met with the teacher . His name was Mr. Bloom. Then in High School I took a year of lessons with a great private teacher named Johnny Jesson. He was just great. BD: Did you play in a school band? I played in my Elementary School Band, then Junior High and High school and then College bands. BD: If you played in band do you remember the band directors name? I don’t remember the band directors name until High School. It was Charles Chin in High School and Roy Cummings in College. Roy and I became very good friends until he died many years ago. BD: Who played the biggest role in your youth to encourage you to stick with music? Well…I guess it would have to be the composer in residence at my High School. Mr. James Gardner. He really encouraged me to keep going because he saw something special in the way that I played. BD: At what age did you realize that playing music was going to be the direction of your adult hood occupation? I think this happened after I performed with the Barry White Love Unlimited Orchestra when I was a senior in High School. I got standing ovations and a pay check. A deadly combination!!!! BD: What message do you want parents to know regarding their role with their kids entering first year band? Parents should be encouraging without being pushy. It takes a long time to become good on a band instrument. So also tell your kids not to be discouraged if they can’t make the same tone that I get on my saxophone after a year or two. It really takes years and years and years to get a good sound so let them know that an hopefully they won’t be discouraged when they sound “ normal” at first. BD: What message can you give to students thinking of pursuing music as a career? I would tell them to do it because they love the instrument that they play and only for that love. Not because they want to be rich and famous. The rest will come if they do things for the right reasons. Playing and instrument for the love of it is success in itself. BD: What artists do you like to listen to today? BD: What influences you to be creative when practicing, recording or composing? I really can’t say. Things just come to me and when I play something special it just “rings true” and I know that this will be a great song, or a great idea to play during a live show, or something that will be great in a recording session. I wish I knew !! BD: What message do you have for band directors regarding their role in the lives of young musicians? Just be encouraging and truthful with students. Don’t tell them how great they are if they aren’t but be careful not to discourage. Try to give them examples of what their instrument can sound like in the hands of a virtuoso. 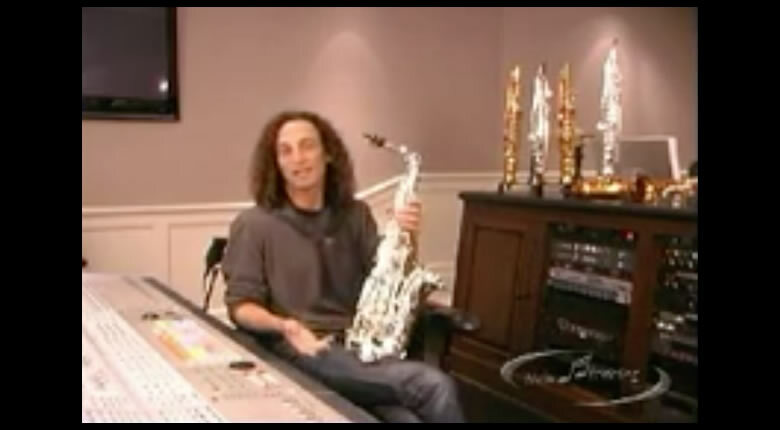 BD: You have a new line of Kenny G saxophones, can you tell us why you decided to enter into the market at this time? Well, the student model saxophones that are out in the market place are just not that good and I wanted students to have a horn that was very close to a pro model without having to pay a huge price for it. I have seen students discouraged simply because they were playing a low quality horn and I felt that I could design a great saxophone and keep the price affordable and with a great saxophone in their hands, there would be nothing to limit the potential of the student except him/her self. BD: What has been the consensus from other repair technicians regarding the quality and durability of your saxophones? Everyone that touches them says that they are exceptional horns. I agree. That’s why I play one on stage for one very special song at each of my concerts. If it has my name on it, it had better be the best. Kenny G, the world’s most renowned saxophonist, will release his first Latin Jazz album, Rhythm & Romance, backed by some of the world’s finest Latin musicians. The result is a rich, one-of-a-kind tapestry of samba and salsa, ballads and bossa nova, all of which are held together by beautiful melodies of Kenny G’s signature sound. The album is a collection of new songs and beloved classics that are rhythmically rooted in two disparate sounds resulting in a completely original and moving work.